Do you feel like going a little crazy this Halloween…and love slasher films? 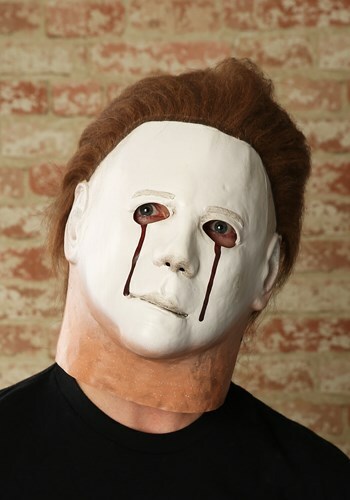 You can act out your favorite scenes with this Blood Tears Halloween II Mask. The moment you enter a room you’ll give everyone the creeps—maybe it’s the stoic expression…or the tears of blood. This mask depicts Michael Myers at the end of the 1981 movie Halloween II when he was shot in both eyes…and that wasn’t even the end of the scene! What can we say, it’s a classic Halloween movie that has earned its fair share of devotees. The terror will continue wherever you go wearing this mask. Will you talk? What will you say? We suggest you get into character, but play nice. It is Halloween after all, and everyone is just out to have a little fun. Maybe pull out a rubber chicken and see what kind of laughs you can get instead. Comedy or horror—you can have it all while wearing this licensed full-head Blood Tears Halloween II Mask! It’s your Halloween, make the most of it! The molded latex mask has brown synthetic hair and painted blood drops, which looks eerily just like the disturbed antagonist, Michael. For the Michael Myers fan, it gets no better!